3D Ultrasound is Here !!! **** This exam is Not a 3D Ultrasound, only done in 2D Ultrasound! QUESTION: Do I need a Doctor's or Midwife requisition? QUESTION: Who conducts the ultrasound session? QUESTION: When is gender determination done? QUESTION: Do I need a full bladder? QUESTION: Is 3D Ultrasound safe? QUESTION: When is the best time to come for my 3D Ultrasound? *** NOTE: Your Ultrasound session is Non-diagnostic. If an area of concern is noted during your session, your primary health care provider will be notified. We DO NOT provide medical or diagnostic advice. ANSWER: No you do not need a doctor or midwife requisition. ANSWER: A qualified Medical Ultrasound Technologist conducts the ultrasound session. ANSWER: Gender determination is done at 20 weeks or later in pregnancy. If you wish to keep the gender unknown, your wish will be respected. ANSWER: No, you do not need a full bladder. A sugary drink 30 min-60 min before the session helps make the baby active. Smoking (including secondary smoke), may reduce your baby's movements. ANSWER: Yes, 3D Ultrasound is safe. There have been no known detrimental effects from the responsible use of Ultrasound recorded. However, we do suggest that you educate yourself on this matter so that you may be able to formulate your own opinion. ANSWER: We request that you obtain the result of your 18-20 weeks scan from your health care provider BEFORE your 3D Ultrasound session. This will confirm the due date, screen for early fetal abnormalities, and to look for any other pregnancy related issues. However, if we are suspicious of a possible abnormality your doctor will be notified. 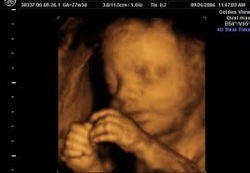 3D Ultrasound may be done between 21 to 36 weeks of pregnancy. However, prior to 26 weeks gestation baby fat deposits and distribution may be limited, making facial features ill defined. We therefore recommend your session be done between 26 to 32 weeks gestation. Ultrasound image quality can be affected by many factors including fetal position, placenta location, the amount of amniotic fluid around your baby and maternal weight or size. We endeavor to obtain the best quality images of your baby. Please bear in mind that image quality will vary from client to client.